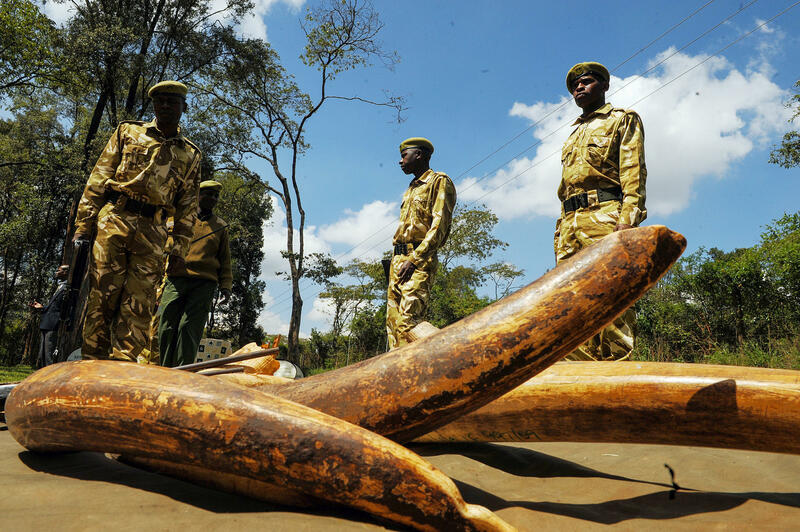 Kenya Wildlife Service (KWS) rangers display ivory seized from poachers around the country. KWS has played a critical role in carrying out operations against poachers. 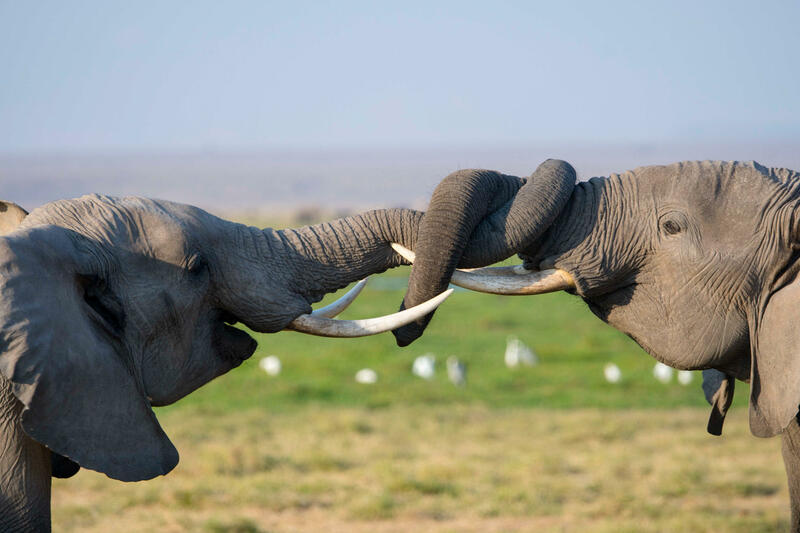 African elephants play-fighting in Amboseli National Park in Kenya. Several years ago, Wasser developed a way to use DNA in tusks to tell what part of Africa the elephants lived in. Now he's trying to use DNA to pinpoint how the ivory is moved to its final destination. The cartels that run the ivory trade try to cover their tracks. They falsify shipping documents, for example, and hide the ivory under other goods in shipping containers. And they send the ivory to multiple ports before its final destination. Wasser analyzed DNA from tusks that were seized by customs officials. He noticed that smugglers often separate the two tusks that come from a single elephant and ship them separately, apparently to make it harder to track where they came from. But Wasser found a pattern. Almost always, he says, "The two shipments with matching tusks passed through a common port. They were shipped close together in time and they showed high overlap in the genetically determined origins of the tusks. "So these three characteristics suggest that the same major trafficking cartel was actually responsible for ... both of the shipments," he says. Wasser says wildlife authorities rarely get enough evidence to identify the big players; often it's their smaller suppliers who get caught with only as much ivory as they can carry. Those convictions are well down the smuggling pyramid and don't do much stem the trade. His technique aims higher. "When you get a strong connection in the DNA, all the sudden that weak evidence becomes much more confirming," he says. Wasser says the DNA technique allows authorities to link different shipments to a small number of ports, made about the same time, with ivory from elephants in just a few locations in Africa — and that narrows the search for the responsible cartel. Writing in the journal Science Advances, Wasser's team has identified three cartels associated with much of the recent trade. They operate out of Mombasa, Kenya; Entebbe, Uganda; and Lome, Togo. Conservationists say it's important to quell demand for ivory as well. The biggest market is in Asia, and the Chinese government has pledged to discourage it within its borders. But data from experts who monitor the Convention on International Trade in Endangered Species say international trade is still running strong even as poaching in Africa has dipped. "We need something really urgent that gets in there and really stops the trade in its tracks," Wasser says. Smugglers are selling tens of thousands of tons of ivory every year. That illegal trade threatens the existence of elephants. Conservationists have developed high-tech strategies to track the source of the ivory. NPR's Christopher Joyce reports on a new effort to trace the smugglers as well. CHRISTOPHER JOYCE, BYLINE: Biologist Samuel Wasser follows the ivory trade closely. He says too many elephants are dying. SAMUEL WASSER: Right now, we're estimating that there are about 40,000 elephants being killed a year. And there's only 400,000 left in Africa, so that's a tenth of the population a year. JOYCE: The cartels that run the ivory trade try to cover their tracks. They falsify shipping documents, for example. They hide ivory in shipping containers. They send the ivory to multiple ports before its final destination. At the University of Washington, Wasser developed a way to use DNA in tusks to tell what part of Africa the elephants lived in. Now he's using the technique to home in on the cartels. Wasser analyzed DNA from tusks that were seized by customs officials. He noticed that smugglers often separate the two tusks that come from a single elephant and ship them separately, presumably to make it harder to track where they came from. But Wasser found a pattern. WASSER: The two shipments with matching tusks pass through a common port. They were shipped close together in time, and they showed high overlap in the genetically determined origins of the tusks. So these three characteristics suggest that the same major trafficking cartel was actually responsible for shipping both of the shipments. JOYCE: Wasser says wildlife authorities rarely get enough evidence to identify the big players. Often it's their smaller suppliers who get caught with only as much ivory as they can carry. Those convictions are well down the smuggling pyramid and don't do much to stem the trade. His technique aims higher. WASSER: When you get a strong connection in the DNA, all of a sudden that weak evidence becomes much more confirming. JOYCE: Wasser says linking different shipments to a small number of ports, made about the same time with ivory from elephants in just a few locations in Africa, reveals which are the likely cartels doing the smuggling. Writing in the journal Science Advances, Wasser's team identifies three cartels associated with much of the trade. They operate out of Mombasa in Kenya, Entebbe in Uganda and Lome in Togo. Christopher Joyce, NPR News. (SOUNDBITE OF ABAYOMY AFROBEAT ORQUESTRA SONG, "MALUNGUINHO") Transcript provided by NPR, Copyright NPR.